Compared to most kidney supplement products, this pill is one of the few oxalate protector capsules in the market that have managed to maintained a high rating for years. And in this detailed Kidney COP review we dig into the facts to see why. Kidney cop is a patented kidney support supplement that is formulated from plant-based ingredients. It is listed as a “Calcium Oxalate Protector pill,” as it is designed to stop, hinder or actively reduce the amount of calcium oxalates in the user’s body. The supplement is said to work 5x (times) more effective than well-known stone breaker supplements, including CHANCA PIEDRA. Kidney C.O.P. ® comes in pills form and has been clinically tested to support proper kidney function, as purported by the manufacturer. In fact based on their analysis, over 90% of people with oxalate sensitivity problems, that is, their body have problems passing oxalate crystals got astounding results after taking Kidney COP for a month. The stuff claims to quickly help the body to eliminate kidney stones by dissolving them, which eases the process of stone purging. So I went ahead and analyzed over 57 user feedbacks from different retailer sites to ensure this particular review provides as much detail as possible, with regard to who makes this product, it’s ingredients, how it works, the possible side effects it may bring and so on… continue reading to find out. Who is the Manufacturer of Kidney COP? This is a patented product of Kidney COP, and the manufacturer bears the same name as the product itself, Kidney COP. The brain behind this supplement is Dr. Matthew Davis, a U.S. based urology doctor with extensive experience in matters kidney health. 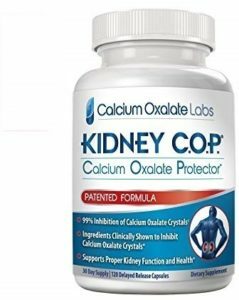 From his testing and analysis, he says Kidney COP ingredients work together to offer the best oxalate health, compared to all other supplements he’s used himself and on his patients, those with calcium oxalate crystal growth complications. How Does Kidney COP Work? Oxalate growth has been a many years health issue. In fact, claims about this health problem have been around for the past 25 years and on. Fortunately, in the past decade or so, more effort is being put to help solve kidney health issues and oxalate sensitivity has gotten traction from researchers. With regard to how kidney COP works, the formula binds to oxalate crystals, to dissolve them. This in effect spits calcium oxalate compound, breaking it further down for easier elimination. The makers of this product say the formula effectively reduces 99 percent of calcium oxalate crystals as well as hinder stone formation and growth. The manufacturer claims they’ve tested Kidney COP’s effectiveness against industry available stone breakers and found it to work five times better than either of them. Kidney COP Ingredients – Are they Safe & Effective? So far the supplement is said to have had its ingredients examined and awarded several US patents for efficacy. The US patents issued on it include, 9,233,135, 9,623,066 and 9,789,152. This is to say the ingredients are safe for human use. It’s claimed that the ingredients in this formula also help in kidney detoxification, plus are Gluten free and non-GMO. People who have issues with dairy products (or vegetarians) are also safe taking Kidney COP for oxalate protection and kidney health. 45 mg Magnesium Citrate – said to help boost normal cell function, nutrient absorption, and nerve-function, normalize blood flow and promote bone health. Vitamin B6 – linked to numerous health benefits including mood regulation, proper production of serotonin and more. 350mg Citric Acid – has oxidative properties, which protect body organs from free radicals, may also help the body to main proper heart health. Banana Stem – associated with proper secretion of insulin and hemoglobin in the body among others. 350mg Pyridoxine HCI – helps to metabolize proteins and fats, boost blood cell health and improved nerve function. What are the Advantages of Kidney COP? Claimed to increase urine pH, this, in consequence, lowers the probability of oxalate crystal formation. Might raise citrate concentration in urine which may significantly lower the ability of oxalate stone size growth. People using this product may benefit from its kidney flushing diuretic properties. Said to avoid oxalic acid absorption in the intestines which basically translates to fewer oxalate crystals in a person’s joints, kidney, and muscles. What are the Disadvantages of Kidney COP? It’s not clear whether long use of this product can treat oxalate sensitivity. The product might only work on calcium oxalate stones (which constitute 80 percent of all kidney stones). Some users may face delayed response, calling for extended use of the product to see results. Some users may prefer supplements that are prescribed once per day, unlike these capsules, which need to be taken twice per day. It’s not clear whether some users may get better results with a customized Kidney COP dosage, differently from the universally prescribed dose. 1 Q. How is Kidney COP Used? “Ans. The manufacturer instructs that users should take 2 capsules of Kidney COP in the morning hours and 2 capsules in the evening from 8 pm. The pills can be swallowed with plain water or fruit juice, after meals. However, pregnant and lactating mothers or persons under medication are cautioned to consult with their doctor before using this supplement. 2 Q. How Much Does Kidney COP Cost? “Ans. One bottle of Kidney COP contains around 120 capsules and cost around $29 on retailer websites. Nonetheless, users who intend to order more, benefit from discounted prices, like $79 for 3 bottles or $149 for 6 packs, saving close to $8 and $25 respectively. For larger orders, you can inquire to know if discounts are offered by the vendor. 3 Q. Where to buy Kidney COP? “Ans. Aspiring users have an option to order this supplement online from the retailer website and it should be delivered within a short time to their doorstep. 4 Q. What is Kidney COP’s Return Policy? “Ans. There isn’t clear mention as to the process of returning this product. However, prospecting users can reach out to the maker of this oxalate protector supplement to ask about their return policy. 5 Q. Does Kidney COP Offer Free Trials for their Product? “Ans. The main website for this kidney health supplement doesn’t indicate whether they offer free trials to people who want to taste its effectiveness. As such, users can buy and try the stuff for themselves. 6 Q. Does Kidney COP Work? “Ans. Users who find this oxalate protector supplement useful and have rated it above 4.5 stars are more in number than the allegedly unhappy customers. Meaning it works effectively for the greater percentage of both first time and consistent users. “Ans. The caps are said to be safe, in that they are gluten-free, non-GMO and toxic. However, users who experience unusual side effects such as rectal bleeding, severe nausea, decreased sensation, dirrhia and stomach upset that seem to emanate from this product should discontinue use and consult with their urologist. In the recent few years, there has been an acute increase in food supplements, which aim to assist kidney health. However, not many of these stuff actually target oxalate formation as the prime suspect for kidney stone growth, but with the few that are in the market, they have been seen to work effectively. Nonetheless, seems users could prefer a once a day supplement for such products, to avoid forgetting to complete the daily dosage. Besides that, the 120 capsules may be less, so it would be good that the manufacturer increases the pills so as to last much longer. Regarding effectiveness and market rating, again kidney cop reviews are way higher, more detailed and overly much positive than most kidney support products. Users who’ve used this formula report of having lesser kidney stones, lesser frequency to the toilet and much happier life. So should you buy kidney cop? The answer is a straight yes! However, if you are pregnant, under 18 years, and are not under any medications you need to involve your doctor before taking this product. Additionally, users who’ve been booked for an operation, nursing mother or any other medical related concerns need to first consult with their medical actioner as well before using this supplement. “I bought this supplement just to try out if can help me to minimize calcium oxalate and vulvodynia pains and it has worked for me. The oxalate sensitivity I faced started some 20 years ago and I was sad that there has not been much done about it in by medical researcher. However, thanks a lot to Kidney COP as it has significantly helped to reduce oxalate-related discomforts in me including muscle pains –well, not sure whether to call that fibromyalgia (I’m not a doctor so excuse me). Now it’s been roughly 2 months using the supplement and I’m happy to report it works for me. Well so far, I’ve not in way shape or form noticed signs suggesting it has side effects – and hopefully this will be the case as long as I’ll be using the product. Kudos for availing such a resourceful product, Thank you, Davis! “Being a vegetarian I had to keenly consider my safety before deciding to order these caps. I read they are vegan-friendly and gluten-free so I bought them. Now 4 weeks down the road using Kidney COP and I can confirm that I’m lucky to have bumped into this product. My body no longer forms oxalate crystal as active it used to, this I know because my urinary frequency, which has significantly gone down, plus, my doctor pointed it out in tests. “I bet you’ve read this far because of either of these three reasons, first, you are susceptible to oxalate build up and kidney stones, wanna know more about this supplement, or you have suffered kidney stones before. Whatever the case, this stuff is better and yields much perfect results than other kidney health caps out there. Well, to cut the long trouser shot (I mean story shot –whatever that means,) I find this product much helpful all-round. Initially, I settled on Chanca Piedra and yes, it worked for me well. However, with the Chanca supplement, you have to boil the tea every other time, when all you have to do with Kidney COP is simply swallow the pills. Another thing that made me shift to COP is because I was starting to feel a bit queasy after taking Chanca Piedra, not really discrediting but it that’s how it made feel. My Urologist is the one who made me discover this product, what I found a not so common case because he hardly endorses supplements, guess he had proof it works – and yes, it’s working for me! Oxalate build up is no longer actively forming like before.